The age of the smart TV is over, says Hisense - the future of television is artificial intelligence. These next-generation sets don't just display images and play sound, but know what's actually happening on-screen and bring you into the action, starting with the 2018 FIFA World Cup. 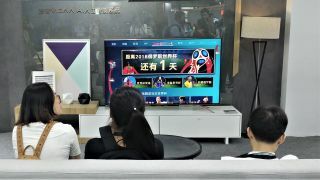 At CES Asia, China's biggest technology show, the company demonstrated its vision with an AI-powered TV that works as a virtual football pundit to help even non-fans wrap their heads around all the tournament's finer details. It includes facial recognition that identifies all of the tournament's 736 players - in both agony and ecstasy - and present full biographies, statistics and headlines plucked from recent articles. If you decide to change sides at half time, the app can even direct you to a store where you can buy a replica of a specific player's kit (though you'll need to scan a quick QR code with your smartphone to actually make the purchase). "We believe this is the debut year of AI TVs," said Yu Zhitao, head of smart TVs at Hisense, as he demonstrated the tech on stage in Shanghai. He says there are four key differences between the smart TVs we know now and the AI TVs that'll soon be making their way into our living rooms. "There's the graphics-based interaction experience, which helps the TV know what it's showing," Yu said. "Voice recognition means the TV can understand and comprehend what the consumer says. Content provided through AI TVs is limitless, and finally they use algorithms and technologies to represent the original graphics and pictures in different scenarios." In short, it's about transforming a passive experience to an active one. Soon we'll be asking questions and interacting with a TV that watches and understands what's on its screen. Recognizing footballers and ordering replica strips is an impressive feat, but a very specific one. After showing off the AI's World Cup expertise, Yu explained some more everyday uses for its image and voice recognition technology. "We see a lot of good images and they remind us of some celebrity that we've forgotten; we see a beautiful garment but we don't know the brand; we see a beautiful place and we want to buy tickets to go there," he said. "The information is boundless, but in the past, because of the lack of technology, we didn't apply interaction to TV sets. We think that when we watch the best TV programs, we should make sure that every image on the screen enables interactions." "It should be accurate in recognizing the voice, no matter the accent, tone or speed," he said as the app delivered a list of Shanghai steakhouses. "It also has to be very fast; the response has to be instant. Finally, the service should be able to interpret. The thoughts of a human will be changing all the time, so new commands should be catered to." Hisense will broadcast every FIFA World Cup match in 4K via a dedicated app that launches on June 14. It also has a special World Cup TV channel plus two special edition World Cup TVs - the U9A and U7A - both of which include a sports mode that makes high-speed images brighter and sharper. "In terms of the sports mode," said Yu, "we look at matches and predict motion on the pitch and make sure there are minimal artefacts. We can dynamically adjust color and saturation, and automatically adjust brightness so we can provide more natural light to the viewer." Again, football is a convenient way to showcase the technology, but Yu explained it has many other uses: "We started by developing better graphics, but there has always been an issue that physical parameters (brightness, for example) are fixed for a certain TV set and don't change. For example, if we have artefacts when we're playing games or we need subtitles, that can't change automatically without AI. "We amassed a great amount of knowledge about image enhancing and then used machine learning to make sure that news programs, sports, games and other scenarios can be adapted to give the best picture quality." It'll be a beautiful game indeed - and you'll look great in that shirt.